As we do prior to entering any new port, Brian and I researched our destination for several weeks prior to arriving. We’d read and taken notes from two cruising guides: Cuba: A Cruising Guideby Nigel Calder and The Cruising Guide to Cuba First Edition by Simon Charles. We’d conversed with cruisers of various nationalities about their experiences visiting Cuba via the water. I’d been learning Spanish from a program called Fluenz (I’ve been thrilled with this program, it’s perfect for my hands-on learning style). Brian was reviewing his high-school learned Spanish as well by using Rosetta Stone. But with all that preparation we still felt the anticipatory jitters of the unknown as we neared the entrance to the Bahia de Cienfuegos. No Guarda Fontera boats came zooming around the corner, no response en Espanol came over the VHF. Here is where arriving last comes in handy. We heard the familiar voice of Matt (sv/Serendipity) on the VHF. He instructed us to continue onward into the bay and head toward the marina, that someone would direct us to a slip once we arrived. Well that’s easy! 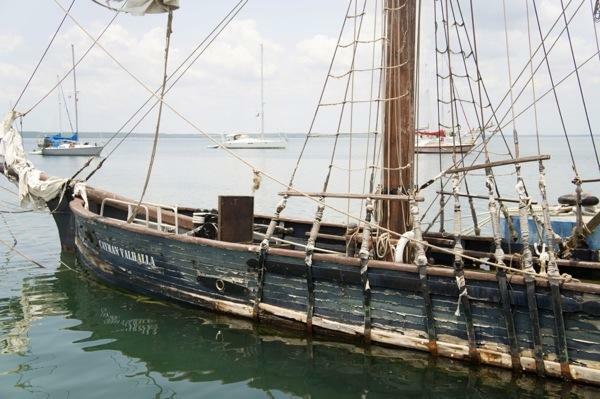 You’ve seen our beautiful Bahia de Cienfuegos entrance photos, a nice ending to our five day sail. So I’ll skip ahead to the juicy stuff…clearing customs! Sure enough as we approached the Marlin Nautica y Marinas a gentleman was on the docks waving for our attention and directing us to a particular slip. That gentleman was the harbormaster and he gave us a smiling, “Hola!” as he grabbed our bow line. Matt and Jessica were also on the dock as was Luki (sv/Skebenga). Quite the welcoming party! We settled in next to our new neighbor (yes, that pirate ship is actually sitting on the bottom and there are real fish swimming on deck), and awaited the parade of officials that per our research would soon be entering and searching out boat. The clearance process wasn’t nearly as intimidating as the guide books had informed. It actually went quite smoothly and lasted about two hours at most. Had we known more Spanish it would have been even simpler. Most of the officials spoke broken English and between that and our combined, limited Spanish vocabulary we did understand what was happening every step of the way. An Immigration officer came to the dock first and requested our passports. Then he walked away with them (SCARY!). Ok, still under our quarantine flag we couldn’t get off the boat in pursuit so…we waited to see what would happen next. A physician on behalf of the International Sanitary Control was our first guest. He completed a questionnaire with us to ensure that we were in good heath and that no crew members had died en route. Then a woman on behalf of the Ministry of Agriculture entered the boat. She inspected the expiration dates on our canned foods and eyeballed our produce. She was quite chatty and gave us some good tips regarding changing money, shopping, and traveling via land in Cuba. Then we had a bit of a wait prior to Customs, Immigration, and Guarda Frontera coming aboard. 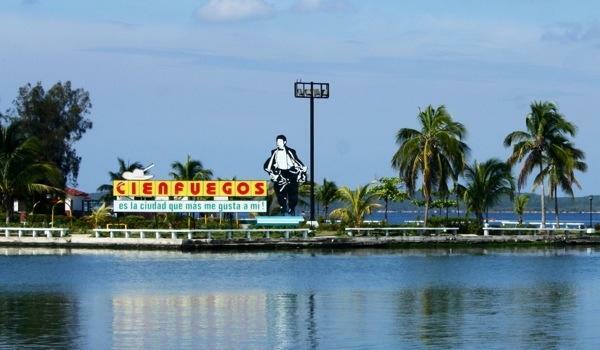 It is important to note that it was extremely hot in Cienfuegos. Of course Rode Trip has no air conditioning, poor ventilation, and little space. When five officials piled aboard representing Customs, Immigration, and Guarda Frontera the heat encouraged them to move through their paperwork as quickly as possible. They brought with them two dogs; each took a turn sniffing through the interior of our boat. It was quite entertaining to have the dogs aboard. They leapt inside with one jump from the hatch and scampered up the ladder with ease to exit. Two men sat at our small table and each completed a pile of paperwork. I had prepared two copies of our boat’s documentation, two copies of our crew list, and two copies of our passports – the documentation and crew lists were appreciated and I didn’t need any more than two. The officials and Brian signed and stamped several documents and left us with a neat stack of papers and two visas. $25/person, Customs $20, Ministry of Agriculture $5, and there was another $10 that quite honestly we don’t remember where it went. We also gave out three glasses of water, one beer, one tube of toothpaste, two toothbrushes, and two sets of Wiki Sticks (children’s toy). Finally, we went to the marina office to complete a contract to stay at the marina. We splurged and stayed at the dock for connivence at $ .53/foot. Docking included water and electricity; we used as much water as we wanted and did not hook up to the electric. The facilities weren’t great; we actually used the shower only once during our week long stay. We preferred to use our own bathroom and solar shower on the boat which were clean. There were no laundry services and there were trash and recycling on site. At the marina we were encouraged to purchase health insurance; $3/day/person. This is twice as expensive as our current health plan. It seemed that only the USA boats were approached regarding this plan. We were given the night to think it over. We forgot to return the next morning to purchase the plan and we were never asked about it again. 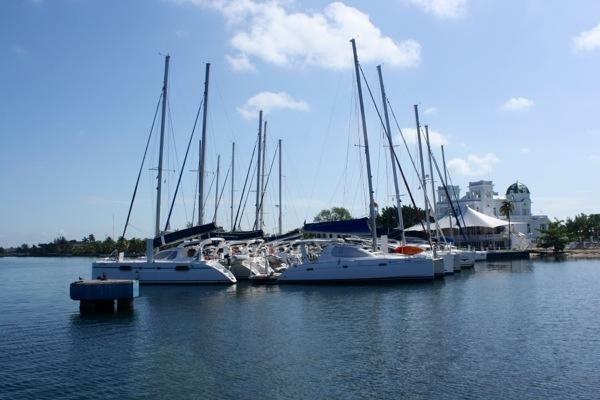 This entry was posted in Uncategorized and tagged 20130509, 20130510, 20130511, 20130512, cienfuegos, clearing customs, cuba, customs, immigration, marlin marina, marlin nautica y marinas by stephanie. Bookmark the permalink. I have been following your progress with great interest. I have friends that are about two weeks behind you so your trailblazing is very helpful. I am very interested in how, as Americans, you were able to visit Cuba. This has been my goal for many years so any insight would be greatly appreciated. Thanks for a great blog.